Ice dams –or ice damming, is an unfortunate reality for some folks here in Genesee County and the Flint, Michigan area as a whole for that matter and if left unattended can wreak havoc on the overall health of your home. While its easy to blame the weather on your winter wonderland woes, homeowners need to understand what an ice dam is and what causes them, to prevent their recurrence and the costly damages that are sure to ensue. So…what is an Ice Dam exactly? An ice dam is the build up of ice near the eave edge of your roof and in the gutters, and this build up prevents the uninhibited drainage of snow melt and rain. This damming allows the water to collect on your roof where it will puddle until to work its way under the shingles and leaks into your homes’ attic and walls until it saturates the insulation and drywall and results in the drips or wetness you may actually see. This water saturation reduces the R-value of your attic insulation and encourages the formation of future and more severe ice damming, and can also result in rot and mold if left unattended. Well… how & why does an Ice Dam form? Ice dams form when warm air infiltrates the attic space and causes the roof sheathing to warm just enough to raise it’s temperature to above freezing . This inturn allows the layer of snow closest to the roof shingles to melt and trickle down the roof toward the eaves. When this snow melt reaches the cold overhang or gutter, it refreezes and begins to create a thick ridge of ice along the eaves and gutters. This process continues until eventually an ice dam is formed. Anything that allows warm air to infiltrate your attic space can contribute to your ice damming problems and the damages they can cause. 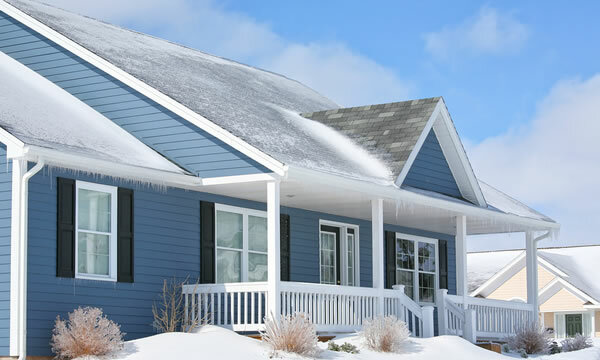 OK…so what helps prevent Ice Dams from occurring? Thoroughly sealing any penetrations and access points to your attic is a good place to start. Applying weather stripping to attic hatches or scuttle holes and properly insulating the attic space can go a long way towards eliminating ice dams and the leaks they create. Ensure that exhaust fans from the bathroom or kitchen are not venting directly into the attic as this will introduce warm air and will have an effect. Also be sure to verify that the ducting from such exhaust fans are of the insulated variety to eliminate heat transfer to the attic space. 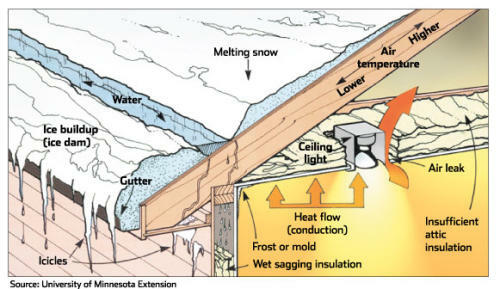 Proper attic ventilation is also beneficial to eradicating the occurrence of ice damming as it helps evacuate any heat that may have radiated into the attic space. A properly ventilated roof structure is one that is balanced evenly throughout the home and utilizes intake vents in the soffit and exhaust vents at the ridge to establish this. Removing the snow from your roof before ice dams are allowed to form is also an option and one that should be used for particularly persistent ice dams. Great care must be taken when removing snow from any roof as the conditions are not favorable and could lead to a severe injury or worse. Caution must also be used when selecting the proper tools to clear the roof, as shovels and roof rakes in the hands of the inexperienced can cause damages to the roof shingles themselves, requiring expensive repairs. Maintaining your roof is vital to the soundness of your home or building and spending a little time periodically will help extend the life of your roofing system and your investment. You should consider contacting a licensed and insured roofing professional if you’re unfamiliar with the tools, equipment and techniques necessary to safely perform roofing maintenance or roofing inspections. If you have any Questions or are in need of some assistance with maintaining your roof, I encourage you to give us a call or click through to our website where you can find other information about A Better Roof For Less and the products and services we offer. You can also fill out our inquiry form to schedule an inspection or ask a question regarding your roofing concerns. Thank You for taking the time to read this article and be sure to check back often for other informative tips on your quest for A Better Roof For Less.